The Vintage Tractor Sitting on Stripped, Scrubbed & Steamed Clean Floor- Success Already! 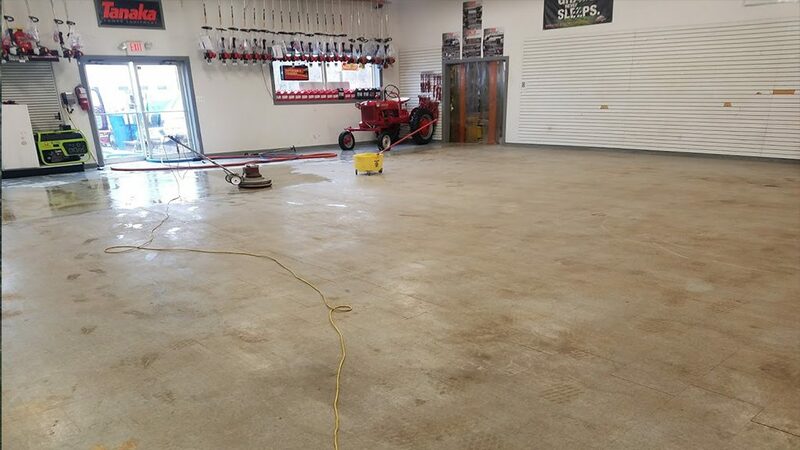 This Delanco business was owner tired of years of dirt, oil & grime. He finally had enough, and wanted to get his showroom stripped and re-waxed so it erased the years of toil and soil. Clearly a seasoned and busy place, George was ready for a fresh start. And what better time than between seasons- just after the height of snow blower season, but before mower season. VCT, or Vinyl Composite Tile is a resilient flooring commonly used in commercial applications. For this project the challenge is to remove the dirt, grit and grime, but also to attack the oils & lubricants that also are evident from the motors and machines that are sold by this company. 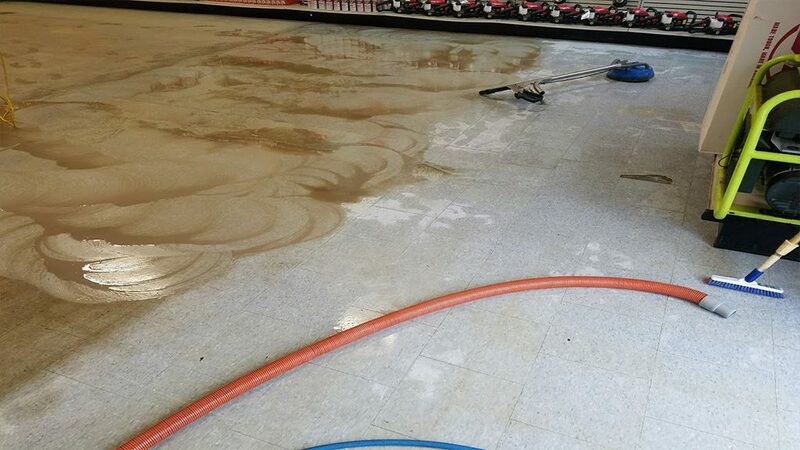 A multi-generational business, this company was due for some floor refinishing. For George it was his slow time, but winter commonly is mis-interpreted as a less desirable time to get floor refinishing or carpet cleaning. But if you think about it, it is the driest time of year, so cleaning and refinishing goes much faster. If we were in Denver, Dallas or Phoenix I would tell you differently, but we are the South Jersey area we are in a damp, humid environment much of the year. With drying inherently on our side we loaded up and were glad to help. 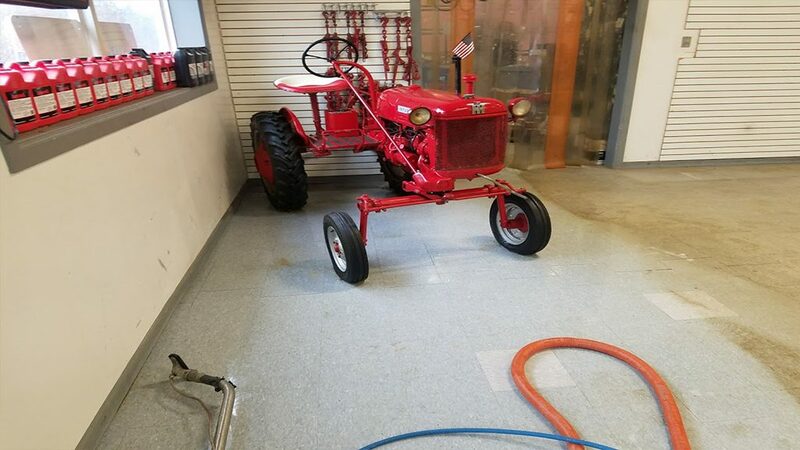 George had the showroom all but emptied out for us- with exception to a vintage tractor that was the living tribute to years gone by. After quick inspection we were ready to lay the stripping solution down. 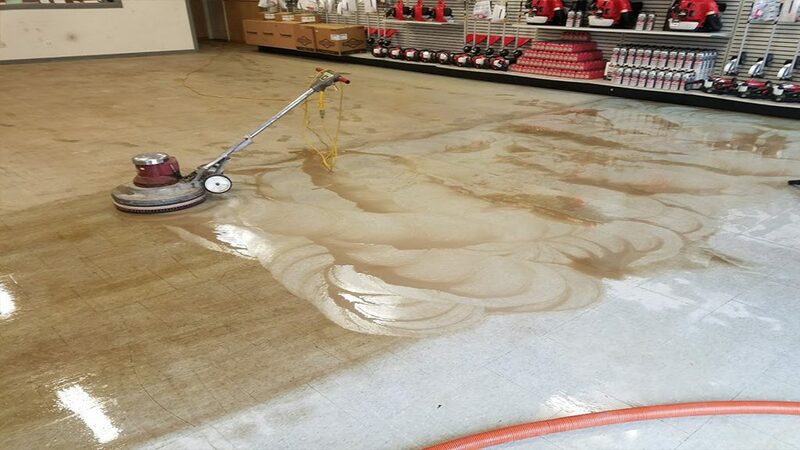 After letting it dwell (allowing the chemical reaction to begin) for a few moments, our guys jumped on our swing machines which rotary scrub the floor, in the traditional manner. As usual, this is the stage where the dirt begins to release, and typically becomes a slurry mess. 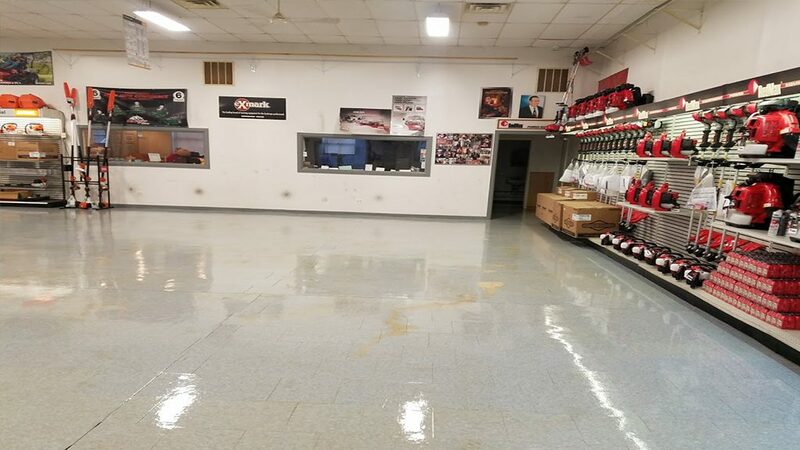 Of course, as expected, and was the case, the dirt on this floor was one “red hot mess!” Swirls and swirls of dirt, grime, sand, grease and oil released from the vinyl surface and foamed up in need of being rinsed off. Our first pass hit the “field” or main part of the floor, then the second pass attacked the edges, with a specialized tool for doing edge work. Again, another inspection revealed we got the soiling removed, we rinsed it and attacked the oil stains as best we could. Now it was “show time.” In addition to the thorough prep, we have in our bag of tricks not only superior stripping agents, and secondary rinsing agents, we also insist upon a superior performing wax product. 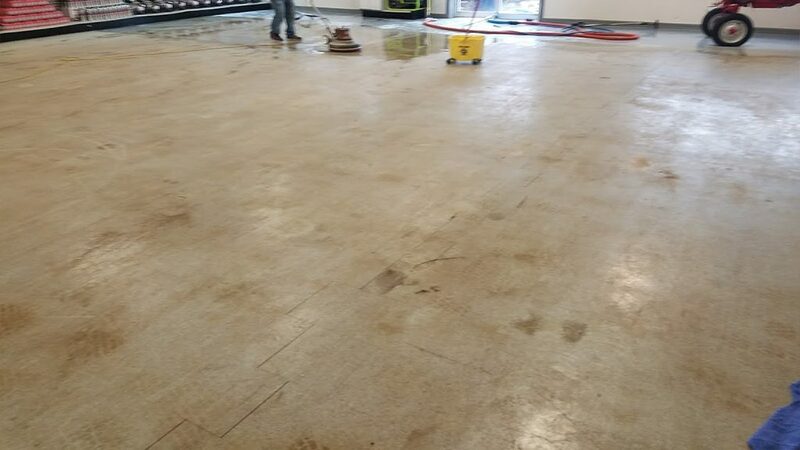 It only stands to reason that you get what you pay for, and when we refinish floors it is done using the finest tools, equipment, techniques, stripping agents and waxes that money can buy. Conversely, you can get a janitor with a mop bucket, wringer mop and stripper to refinish your floors more cheaply, but that is not how we do things. And, that is not what our clients want- they understand there is an investment in a superior job, and the results pay for themselves. Waxes are a dime a dozen, and clearly many are formulated to get the job done, but with little protection or expectation of performance. The priority to select and use an appropriate wax for the situation is critical. 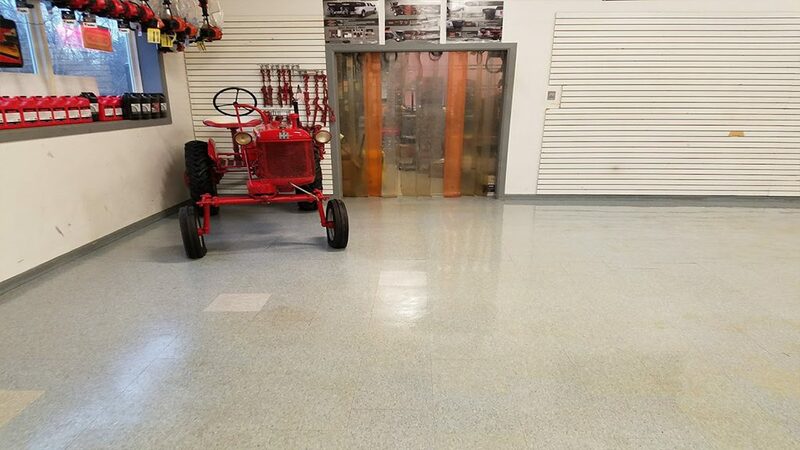 And with over 45 years of waxing experience, there is no cutting corners or cheapening when it comes to our protecting the floors with a resilient shine. Our wax of choice, a blend of materials with a 25% solids, the workhorse component that will resist exposure moving forward. Three coats of wax will be applied, each after the previous coat being allowed to completely dry. 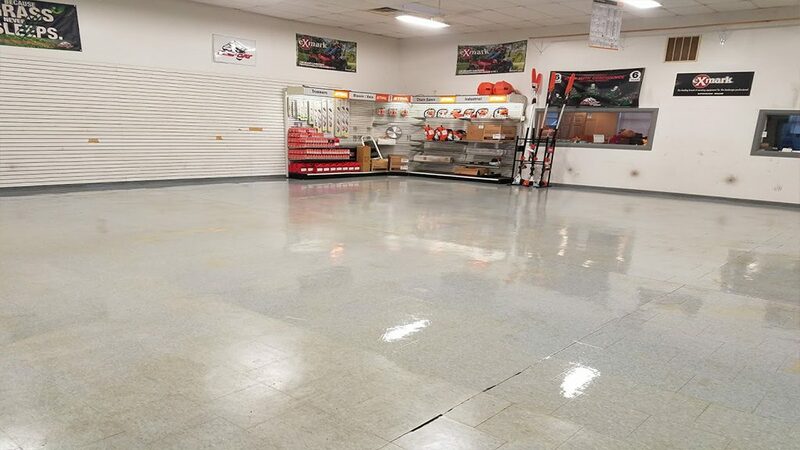 Delightfully, the floor now shines and creates the canvas with which to showcase the tools and equipment this owner is proud to display. Our job well done, and one very happy and satisfied customer! 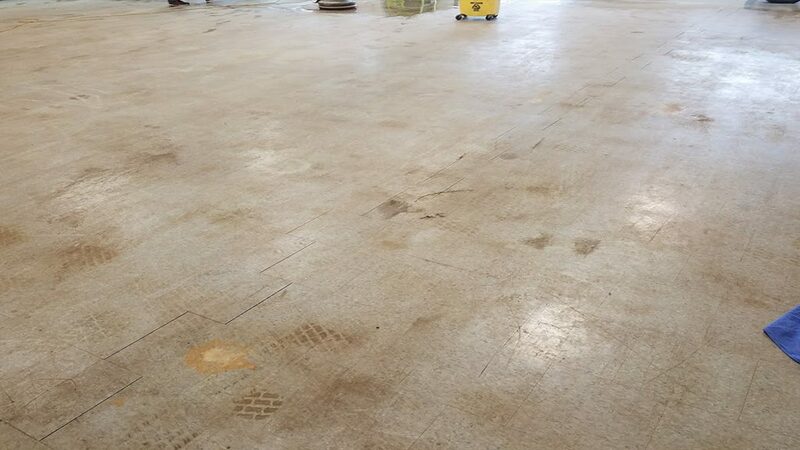 What are the goals in refinishing floors- a thorough, beautiful resilient floor that will withstand soil, spillage and traffic for a optimal time before re-coating or re-stripping, or is the goal just to give it a once over? Often the stripping process involves a considerable amount of preparation, so investing in a superior job will pay off for business owners. Let’s face it, clean floors, clean bathrooms or a showroom that show cases its wares in the best possible light is a reflection on the business and the brand, and has an impression on every customer, client, potential client who comes thru the door. Your choice. Clients in need of stripping and waxing commercial floors are now offered a superior, state of the art method of refinishing, where the results far surpass old techniques provided for generations. Advanced technology assists our proven methods and simply outshines what others can achieve. Our stripping and refinishing is the finest process available, and the secret long sought after by empowered, educated and quality oriented clientele. In fact, a former client, PSE&G studied and adopted our program for maintaining floors, and rolled it out across all their bldgs throughout New Jersey- the ultimate compliment for us!